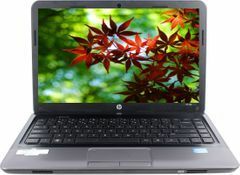 HP 450 .This laptop is very good laptop, I have been used this laptop since 3 years, It has a good performance like processor core i3, 4 GB RAM, and Hard Disk Drive is 500 GB. The 13.86 inch screen is pretty display quality and screen is highly HD.Its weight is 2.25 kg.It gives 5 hours of battery life which is better then other laptop.It have 6 celled battery.HP is a standard company.HP one of the best machinery company in india. I like HP companies product because its brand is awesome.In this PC you can play your favorite games also, no hanging problem in this PC overall it is best laptop in its price range. Thanks.